Not so long ago I blogged about our visit to Fresselines, where the well named moaning impressionist Monet hung out from time to time. And whined mainly. Another, less whingey artist who spent time there was Léon Détroy. There’s a plaque to prove it. Léon who you’re probably saying? 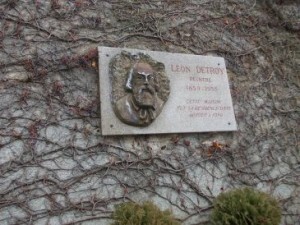 Léon Détroy is not as well known as many of his contemporaries, largely because he retained artistic independence and didn’t jump onto any of the various band wagons. It was said of him, “He belongs to no master, to no school”. He painted how he wanted to paint. 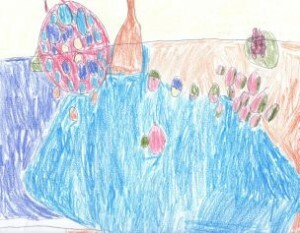 At times there’s a very Van Gogh element to his work and at other times he’s distinctly impressionistic. 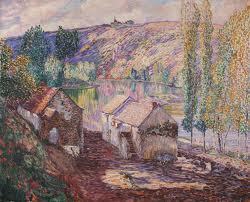 He was born in 1857 in Chinon and came from a family of winegrowers and doctors. The artistic influence came from an uncle who was an archeologist and art collector. He carried on painting for most of his 98 years but enjoyed his greatest success after he died, as seems to so often be the case with artists. So, now you know who Léon Détroy is.